In an All-Spanish League showdown in Group E, Unicaja Malaga improved to 4-4 by downing Laboral Kutxa Vitoria 71-81 on the road Thursday. 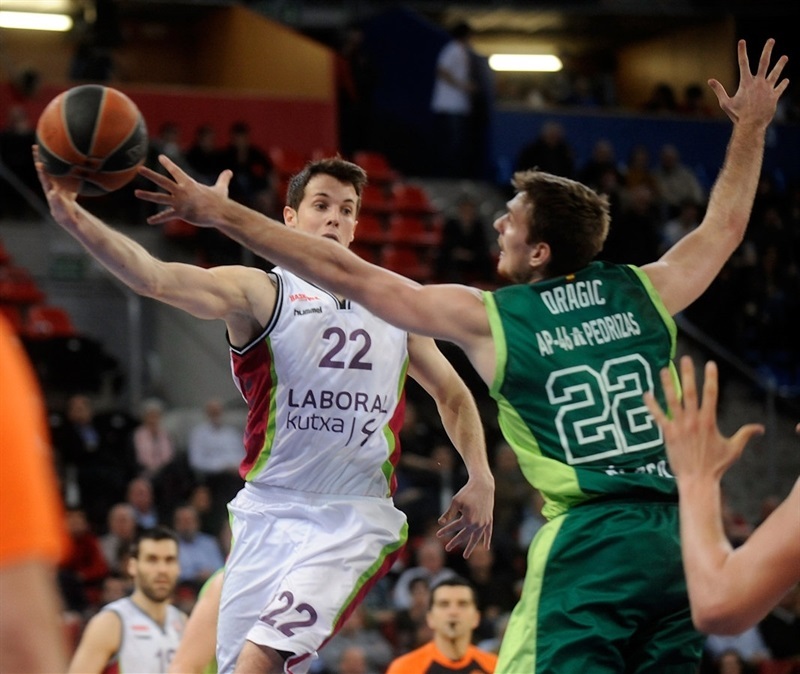 Unicaja registered its second road win in the Top 16, while Vitoria dropped to 1-7 after its seventh consecutive loss. Ryan Toolson paced the winners with 14 points. Nik Caner-Medley added 12, Mindaugas Kuzminskas had 11 – all in the first quarter, Txemi Urtasun 10 while Vladimir Stimac grabbed 10 boards for Unicaja in helping his team outrebound Vitoria 31-41. 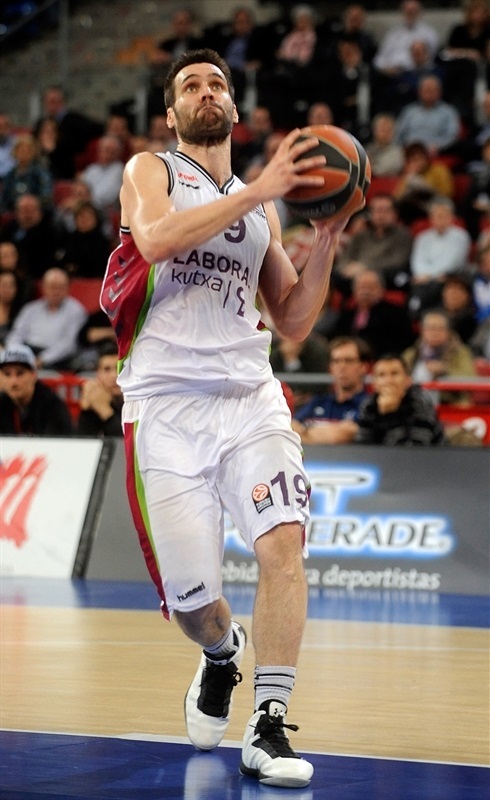 Andres Nocioni led Vitoria with 18 points. Fernando San Emeterio added 17, while Fabien Causeur had 10 for the hosts, whose most-recent signing Lamar Odom made his Euroleague debut. Kuzminskas and Caner-Medley helped Unicaja build a 16-26 margin after 10 minutes. An outstanding Toolson hit an off-balance shot that broke the game open, 22-40. A layup by Zoran Dragic boosted the guests' lead to 24-47 at halftime. Nocioni led a 15-0 run which brought Vitoria back to life, 50-60, after 30 minutes. Toolson and Carlos Suarez kept Unicaja way ahead until the final buzzer. Kuzminskas got Unicja going with a layup that Fernando San Emeterio bettered with a three-pointer for a 3-2 Vitoria lead. Jayson Granger hit a jumper, but a triple by David Jelinek put the hosts back ahead, 6-4. 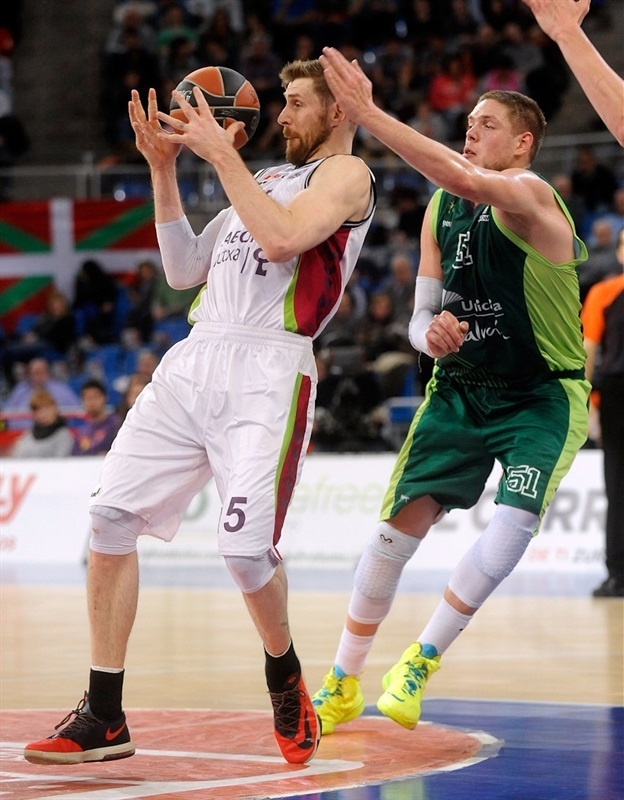 Kuzminskas and Nocioni traded baskets and a three-point play by Caner-Medley allowed Unicaja to get a 8-9 edge. 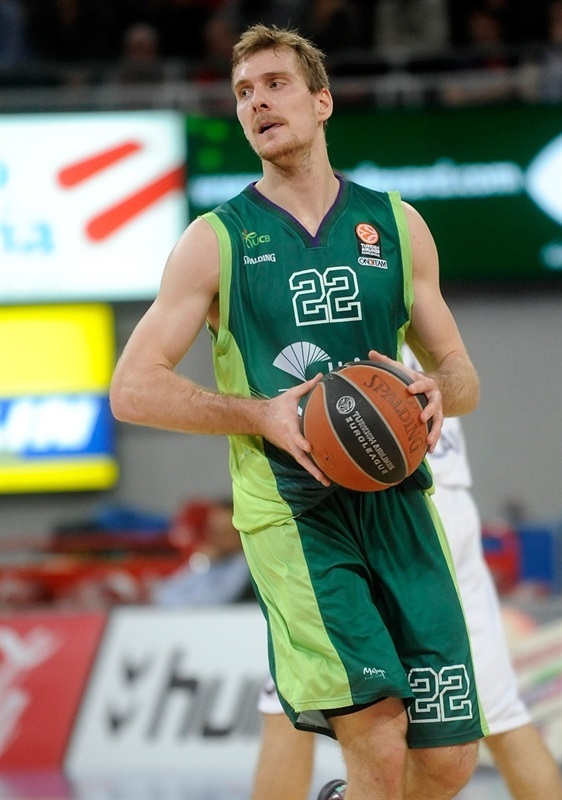 Kuzminskas kept pacing Unicaja with back-to-back baskets, but a layup-plus-foul by Tibor Pleiss kept Vitoria within 11-13. 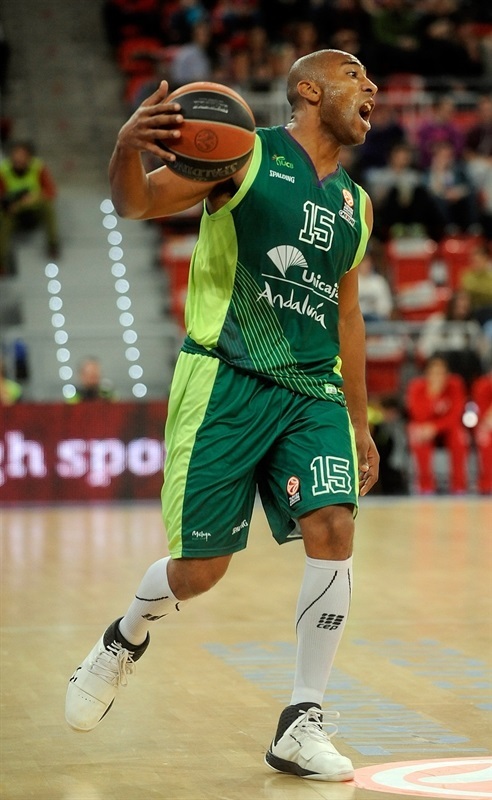 Caner-Medley dunked, igniting a 0-7 Unicaja run in which Granger had 5 points to boost Unicaja's lead to 11-20. Nocioni shined with a driving layup that a red-hot Kuzminslas improved on with a three-pointer that made it a double-digit game, 13-23. Caner-Medley provided a highlight with a wild three-point play that Pleiss matched with his own layup-plus-foul to keep Vitoria within 16-26 at the end of the quarter. Leo Mainoldi struck from downtown early in the quarter, getting the crowd involved at 19-26. Unicaja was all over the place on defense, denying passing lines. Meanwhile, the guests found a go-to guy in Toolson, who hit consecutive jumpers that kept Unicaja way ahead, 19-30. Domantas Sabonis took over with a six-meter jumper and free throws by Urtasun broke the game open, 19-35, after a 0-9 run. Vitoria went scoreless for more than 3 minutes until Mainoldi split free throws. Causeur added a layup. 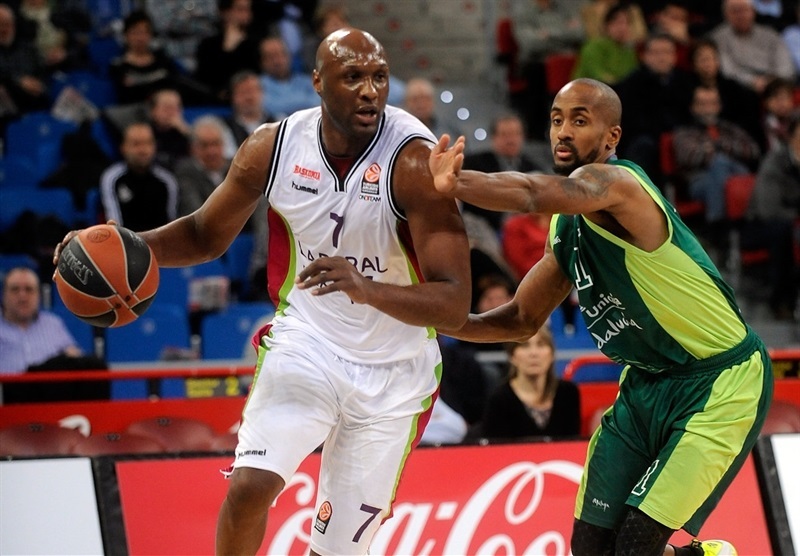 Odom came off the bench to make his Turkish Airlines Euroleague debut. Earl Calloway downed a three-pointer and Toolson took over with an unbelievable off-balance shot, good for a 22-40 Unicaja margin. San Emeterio tried to change things with a put-back basket but free throws by Caner-Medley and back-to-back baskets by Stimac and Zoran Dragic fixed the halftime score at 24-47. Both teams struggled to score after the break until Causeur stepped up with a driving layup. Stimac scored around the basket and Nocioni split free throws, as Unicaja kept dominating the game tempo, using longer possessions now. Thomas Huertel and an unstoppable Stimac exchanged baskets and a layup by Causeur brought Vitoria a bit closer, 31-51. Heurtel hit a six-meter jumper and a corner three-pointer by San Emeterio got the crowd involved at 36-51. Nocioni also struck from the same exact spot, which caused Unicaja to call timeout. Nocioni made free throws and a three-pointer by San Emeterio capped a 15-0 run that brought Vitoria as close as 44-51. Unicaja was held scoreless for almost five minutes until Granger made free throws, which Toolson followed with a triple for a 44-56 Unicaja lead. Nocioni split free throws, Urtasun swished a six-meter jumper and a layup by Causeur brought Vitoria within 47-58. 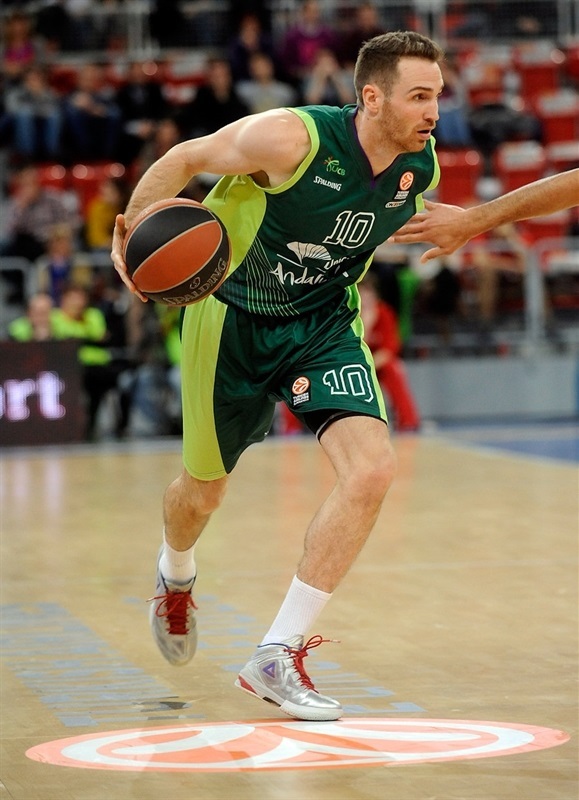 Nocioni shined with a three-point play, but Toolson gave Unicaja a double-digit lead, 50-60, after 30 minutes. Causeur scored in penetration early in the quarter, but Suarez did better with a bomb from downtown. Urtasun made free throws to keep Unicaja out of trouble, 52-66. Mainoldi hit a running floater, before Urtasun banked in an off-balance shot. A layup by Pleiss gave Vitoria some hope at 56-68. Unicaja kept dominating the boards and a put-back basket by Suarez gave the guests a 56-70 edge withsix6 minutes left. A three-pointer by Toolson sealed the outcome. 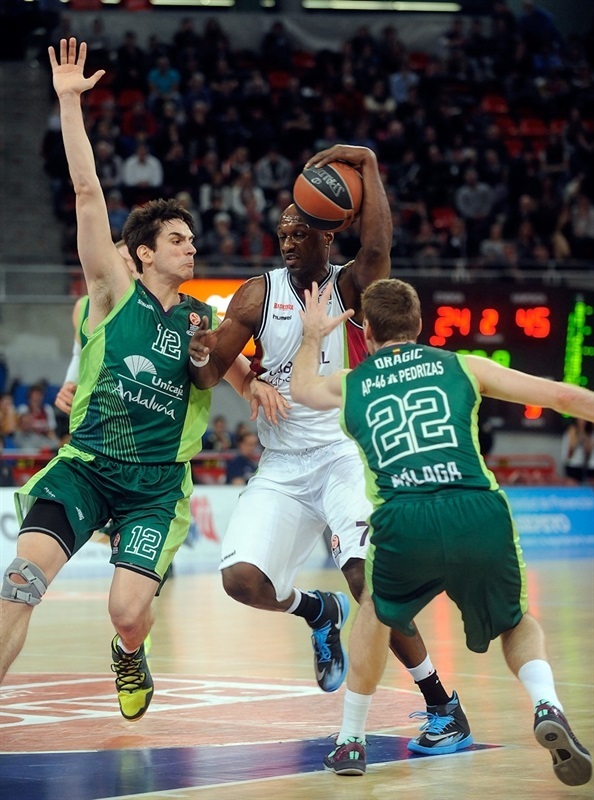 Both teams kept fighting for point differential, as Vitoria won by 14 in Malaga. Nocioni shined with a finger roll layup, but Calloway did better with a triple. Heurtel, Suarez and Adam Hanga also connected from downtown and free throws by Nocioni made it a 14-point game. San Emeterio allowed Vitoria to keep the tie-break advantage, but Unicaja returned to Malaga with a good-as-gold road win. "We must apologize to the fans because of the bad first half we played, in all aspects of the game, and obviously it is the head coach who must stand up in front of everyone representing the whole team. Kuzminskas and Caner-Medley started very strong and we didn’t know how to stop them. 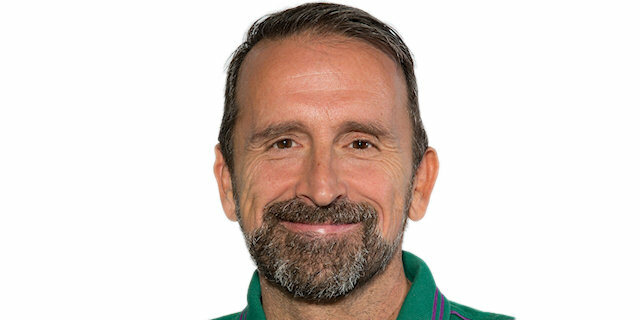 We rushed too much in shooting, something happens to us sometimes when we feel the anxiety, and when the opponent builds a double-digit lead, we are unable to manage the pressure. We started pretty well in the second half, played with strength, intensity, passed the ball, and ran the court. We reduced the margin to just 7 points a couple of times, with the ball in our hands, but we didn’t understand that the game was already in our reach, and we made bad decisions again and let them rebuild a solid margin of 12 points that killed the game." "We have been unable to win here over the last eight years. We lost a lot of games here, but besides that, it was a great win for us tonight as we came without three players. Seeing our condition it was an extremely difficult task, but I liked what I saw tonight, how the players reacted, how we fought to mark our territory and the winning desire we showed. I didn’t like how we played when we thought the game was already won. That means that we forgot who we were fighting against. It was a valuable win against a tough contender, as Laboral Kutxa is that kind of teams that is always dangerous no matter what, even with injuries, new players, etc. This win allows our team to keep dreaming of making it to the playoffs, something that was hard to believe not too long ago. We allowed them to come back in the third quarter by turning the ball over too many times and taking bad shots, but in any case I had to use several players in positions that they are not familiar with, and this is quite important for us." "It’s so good just to be out on the court and play basketball again. Last time I played five on five in competition was in the last round of the playoff last year, so it was so good to be back. 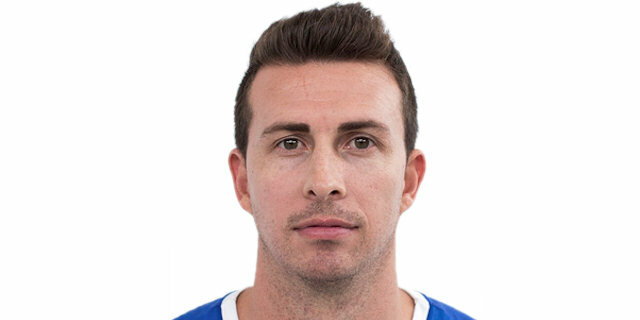 Andres Nocioni is my role model now, he has a lot of experience, and he had a great performance tonight. Of course the game was not a success, and the team needs work, we have to get everybody on the same page. This team has the challenge to make a run to put us in a good position to compete as much as possible." "We didn’t expect such a big advantage at halftime, absolutely not. They beat us in our home court in the first leg and they beat us also here in the Spanish league. I think we were able to play a little bit more relaxed. We had a hard time this week as we are missing several players, but we were able to take up the pace and make up what we were lacking inside. We had only Vladi as a true center and players like Domas Sabonis are only 17 years old. And we made a lot of shots in the first half. I think it wasn’t a matter of relaxing too much after halftime, they came up stronger, and I think they didn’t play a single play in the third quarter, they did all fast transitions, they found open guys, moved the ball quickly and put us in trouble. Fortunately we were able to take the lead back. Inside the locker room we always believed we are able to make it to the next stage, we were able beat great teams in the Euroleague like Panathinaikos or Fenerbahce, and hopefully we can do it again and get to the next level."